Glad to hear the young pup is still barking! No, seriously, those are very good news, he'll be as good as new. Just giv'im some time to recover. Great news, midnightrider. We are all so happy he is doing well. hey guys! finally gots some internet, and I can update you guys on how I am. thank you for all you guy's support. it means a lot! my left leg is healing, and my right leg is getting there. but i've got to go. With everything against you, you can only push back. Way ta go, kid! I wish you a quick and easy recovery! The weather this morning was bad, but i was determined to get this over and done with. Boy, I am really late to the party. 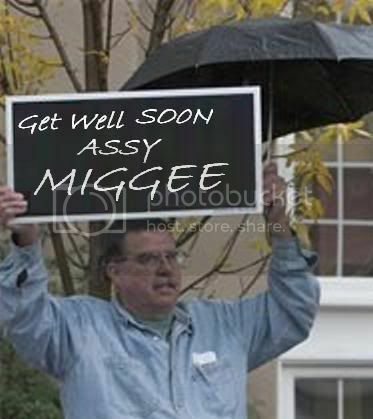 Assy, I take it that you're still in the hospital, correct? My wife is a nurse, and keep in mind that the night nurses do talk, if you know what I mean. Glad to hear that you're feeling better. Are you ready to transfer that pain onto any lads yet? Glad to see... er.. hear from you Assy. Glad that you are doing well enough to drop in on us. Laughter really does help you heal, so yuck it up man! Glad to have you back assy-miggee even if it only temporary. Continue to get better and come back ready to cause some lad pain. Wooooo glad to see you back. You did have someone get you a copy of Shiver's book at least, right? i just got pics msg, they got him somewhat mobile to day, in a whele chair. this is good news, now if i can find that disk to the wify card i took him he should be back on line. keep smilling, cause he is doing fantastic. Glad to see you posting, again assy! Glad to see you back here (although I don't actually remember seeing you around before, but what the hell...). he said today that they may be letting him go home soon. i duno how soon, but this is a good thing. I am honored to be among such people as the 419 baiters. i know we are a secretive parinoid group, or just in it for the fun of the tourture of lads, but this thread has made me a life long member of this group. I am happy to know each one of you. We thought he was going to die the first few days, and i reached out to a bunch of strangers not knowing where else to turn to. The response was overwhelming. Thank you all. now they are talking about leting him go home, and i feal down in my heart that we all had a hand in his recovery. he may walk with a limp, but he will walk. his noodle isn't scrambeled, brakes will mend, and i dont think you gota have a splean, not sure what one of those is for anyway. but the funloving nephew is going to be ok. he will have a few scars for story time, but he is gona be ok.
Assy, it's great to see you posting here, and to know that you're on the mend. Midnite was so worried about you, and if anyone's prayers worked, surely it must have been his. I am so glad to hear the good news. I'm glad that we were here for you then and are here for you now.